As we all know, the Super Smash Bros. Ultimate for Nintendo Switch is coming to the end of this year, but with that, you have also said that the GameCube controller will also be announced which will be great for playing Super Smash Bros. The PDP company has unveiled three new controllers in the perfect Gamecube style created specifically for Super Smash Bros. Ultimate. 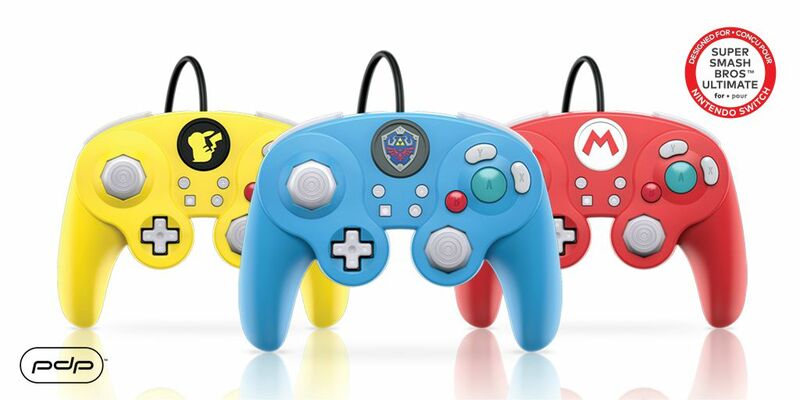 They are called Wired Smash Pad Pro and will be available in December in three different colors: Red (Mario), Azure (Zelda) and Yellow (Pikachu). The controllers will be equipped with a USB cable about three meters long to connect to the Nintendo Switch and will be able to replace the C-Stick pad with a longer analog stick, comfortable and performing. At the moment, no information on the launch price has emerged, but we are sure that new information will soon arrive. We also report that a few days ago Hori also announced the debut of new Gamecube-style controllers for Nintendo Switch and here also all three controllers feature same colors and names. In the Hori pads, the C-Stick cannot be replaced, however, in addition to a surface created to give more grip, the possibility to map the L / R and ZL / ZR keys has been confirmed. The GameCube Controller Super Smash Bros. Ultimate Edition is already up for pre-orders via Amazon for $29.99 and will be released on December 31, 2018. While the Super Smash Bros. Ultimate for Nintendo Switch can be pre-ordered at $59.99 and will be released on December 7, 2018.